Darjeeling: Believe it. Brazil lifted the Fifa World Cup 2018 trophy in Darjeeling, which likes to call itself "The World Cup Town". The final was played between six teams with Argentina, France, Belgium, Croatia and England completing the line-up. And if you thought that Cup finals are only played between two teams, you just need to jog your memory to 1950. In that edition of the tournament, Brazil had lifted the Cup by winning in a league format consisting of four teams that had entered the final group stages. 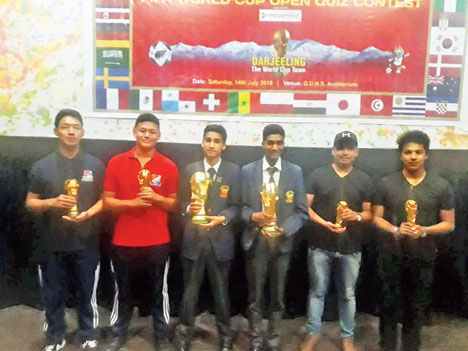 On Saturday in Darjeeling, this Fifa precedent was played out to justify a final of six teams at the Fifa World Cup Open Quiz Contest 2018, held at the Gorkha Dukha Niwarak Sammelan Hall. The open quiz contest was organised by a group of quizzers - Udaya Mani Pradhan, Prolad Roka, Lakpa T. Sherpa, Diwarkar Thapa and Jit Pradhan under the banner Megamind. If the Samba boys had disappointed their fans all over with a quarter-final exit in Russia this year, the Brazilian team consisting of Ronhit Luitel and Arbind Kumar Prasad of Gyanoday Niketan knocked down their opponents in Darjeeling. Accumulating a whopping 209 points, the Gyanoday boys pushed the England pair of Nawang Sherpa and Aradhya K. Yonzone - students of St Joseph's School (North Point) - to the second spot with 98 points. Hopes are high that Croatia, which has reached the World Cup final for the first time, will lift the trophy in Russia. But in Darjeeling, the team consisting of Yogesh Thami and Ashish Tamang, who are now out of college, had to settle for the third spot. How many teams have lifted the World Cup till now? Eight, came the answer from the Brazilian team, to a loud round of applause. The applause continued till they held the Cup. "It feels good," gasped Luitel, admiring the trophy in their hands. "The basic objective of this event it to give a meaningful farewell to this entertaining tournament and to encourage open quizzing in town. We have taken a small step forward," said Udaya Mani Pradhan. Nearly 50 teams had participated in the quiz, of which the six made it to the finals. Believe it. Brazil lifted the Fifa World Cup 2018 trophy in Darjeeling, which likes to call itself "The World Cup Town". The final was played between six teams with Argentina, France, Belgium, Croatia and England completing the line-up.